Falls are the most common accidents in the home. This is particularly true among the elderly and is what most family members worry about when their loved one is left alone. Most falls occur in the bedroom or bathroom. They are usually the result of slippery floors, throw rugs, inadequate lighting, cluttered floors and slippery bathtub and showers. In order to minimize clients from falling, our team of RN Supervisors conduct a thorough FALL RISK ASSESSMENT on their Initial Visit. 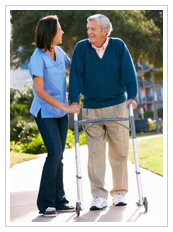 Fall prevention information is reviewed and given to the client and other family members. The purpose of the Fall Risk Assessment is to clearly identify if the client is at risk and take preventative measures to ensure their safety is maintained at all time. If the client is considered a “fall risk” then Fall Precautions are reviewed on every RN Supervisory Visit. Recco wants to make sure your loved one is safe at all times. Recco strives to maintain a safe environment for every client. The following measures can help prevent falls in the home. • Have good lighting in rooms and hallways. • Keep electrical cords and extension cords out of the way. • Make sure crutches, canes and walkers have nonskid tips which prevent slipping or skidding on floors. • Have a night-light on in the client’s room. • Lock wheels of beds and wheelchairs when transferring client to or from them. In collaboration with the client and family, the RN Supervisor can arrange for Occupational Therapy and Physical Therapy referrals. Together we can take a team approach to determine the safest Plan of Care.